The last lesson I’m going to share with you/burden you with from our Disney experience is this: there’s always someone watching. 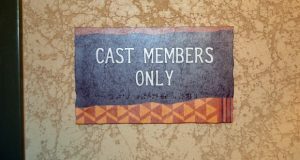 The signs on the ‘no entry’ doors at Disney don’t read ‘Staff Only’, they read ‘Cast Members Only’. Every single person who works in Disneyland – the poor sweating souls in the Disney costumes, those managing the queues for every attraction, the waiters in the restaurants, the shop assistants, even the maintenance staff and rubbish collectors (garbologists?) – is not just someone working in the park, they’re part of the Disney show. Which makes sense: any one of them could be the next point of contact with a customer (or visitor, or guest, or whatever the approved Disney word is for a punter). And all of them make up the overall feel of the place: the rubbish collector who samba-ed along to the music, the ride attendant who pretended to steal my daughter’s toy and make it his pet, the popcorn seller who complimented me on my French accent – all of them made the experience more joyful for us. They saw themselves as performers, entertainers, not just workers, and they rose to it magnificently. I loved the way the characters stayed absolutely in character with their distinctive mannerisms not only on stage but as they walked through the park or onto/off stage, chatted to each other or other ‘cast members’: they never forgot that even if they weren’t actually performing, people were watching. Do your staff realise they’re lead performers in the show that is your business? Do YOU? Every time you interact with a customer, or even are visible, it’s showtime. Smile, and give the people a good time.